AIP prepared and published a Concept Paper on Amendments to the Access to Public Information Legislation. The Concept aims to present a broad range of problems stemming from the Access to Public Information Act implementation practices and possible solutions for their overcoming﻿﻿. The Concept was prepared by AIP experts Alexander Kashumov, Gergana Jouleva and Darina Palova. Remarks and suggestions were goven by Anton Stoichev from the organization Obshtestvo.bg. 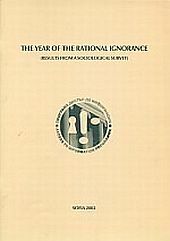 More about AIP audits and surveys in the special section: http://www.aip-bg.org/en/surveys/2012/204468/﻿. The AIP team performed an audit on the institutional web sites within 22.02 - 25.03.2011 with the purpose to evaluate the implementation of the obligations under the Access to Public Information Act (APIA) for online publication of certain categories of information and under other regulations for active disclosure of public information by the executive power bodies at a central, regional, and local level. 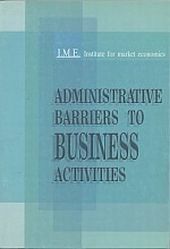 Comparative results from the assessment of institutional web sites performed by AIP in 2006, 2007, 2008, 2010. More about AIP audits and surveys in the special section: http://www.aip-bg.org/en/surveys/2009/206924/﻿. Access to Information Programme held a National Round Table (NRT) on March 14, 2008, Sofia. Problems faced by nongovernmental organizations when they exercise their right of access to information were discussed and strategies for advocacy work in the area were be outlined at the forum. Participants at the National Round Table discussed and adopted a Memorandum with specific recommendations for the improvement of the access to information situation in Bulgaria. 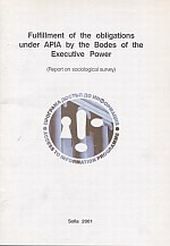 This report presents the results of the sociological survey „Fulfillment of the Obligations under APIA by the Bodies of the Executive Power 2002.” It outlines developments in the implementation of the law during the previous years and covers the bodies of the executive and the 100 largest Bulgarian municipalities by population.